The Egg100 will be available in red, white and black. 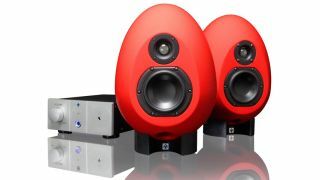 MUSIKMESSE 2015: MunroSonic has unveiled another oval speaker setup in the shape of the Egg100 monitoring system. Taking its lead from the Egg150, this is a smaller, more affordable setup with a 4-inch driver. Designed for use in near-field situations, this offers continuously adjustable frequency response and an angled bass port. There's also a 'variable tilt base' that allows adjustment of the upward angle of the listening axis, the theory being that this enables you to avoid interfering reflections from your mixing console or desk surface. The Egg100 ships with a separate control unit and amplifier which features active analogue crossovers, LF and HF trim pot EQ for location setup, and a Class-A headphone amplifier. You can find out more on the MunroSonic website, and you'll be able to buy the Egg100 monitoring system from May for £1560/$1999.